I'm interested in what your desktops look like. Messy, clean, ugly! Whatever you have post it up. Epsilon u press print screen and then open anything u can paste into and save it tada! My new desktop. Basically the same icons...maybe, don't feel like checking the old picture. You have to be a member to see threads on there. I don't plan on joining. But the point is to show your actual desktop not show a wallpaper. All you have to do to do that is push Print Screen, then paste in to Paint, and save. Then when you post add it as an attachment, which can only do if you use the full reply box, not the fast reply. My eyes they burn. So bright, how can you look at that all day. Anyway, I can try and make you one. I'm not very consistant, so u know if I make an abstract, it may be bad. sorry forgot you had to be a member to see the thread. oh and that link was to my desktop, not a wallpaper. Man your desktop is clean lol. 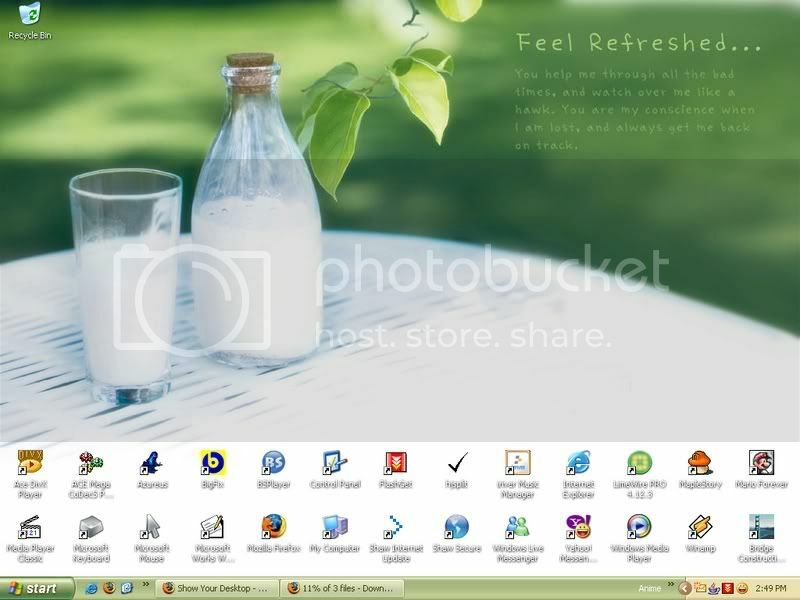 Unusual desktop bro, I never saw a desktop with shortcuts on the bottom..
Heh, I can rotate my desktop, it's funny lol. lol yeah, I put it there since I didn't want to cover up the writing. Haha wow you guys are pretty creative. Wow Jim!!! that is pretty cool! Bottom is my old one, Top is my current. Both rock.